6-Banner Sunday is Inside the Hall’s weekly newsletter in partnership with The Assembly Call. More than 5,000 Indiana fans receive the newsletter each week. In addition to appearing each week on the site, you can also opt to receive 6-Banner Sunday by email. A form to subscribe via email is available at the bottom of this week’s 6-Banner Sunday. Should IU stay or leave the Crossroads Classic? That’s the question on the minds of many fans and IU reporters in this week’s 6-Banner Sunday. Should IU stay in the Crossroads Classic? It’s been a debate around Hoosier nation for years. But now, with the Big Ten conference schedule expanding to 20 games, each game of Indiana’s non-conference schedule becomes more critical to building a solid resume for the NCAA tournament. So is an annual neutral site game against either Butler or Notre Dame good enough for Archie Miller and the Hoosiers? Or would replacing it with a neutral site game against an out-of-state foe be a better option? That’s the conversation that our pals Chronic Hoosier and Zach Osterman had in their Indy Star podcast Mind Your Banners this week. The duo explores the pros and cons of both sides of the debate, and talk about the potential alternatives if IU were to bid adieu to the Crossroads. The 2018 NBA draft came and went without any Hoosiers hearing their name called, but at least one outgoing senior will be getting an opportunity to prove he belongs in The Association. On Friday, it was announced that Robert Johnson will be playing for the Atlanta Hawks in the upcoming Salt Lake City and Las Vegas Summer Leagues. An honorable mention All-Big Ten player for the 2017-18 season, Johnson averaged 14 points per game as a senior. He’ll have the opportunity to play alongside the likes of first-round picks Trae Young of Oklahoma and Kevin Huerter of Maryland, who were selected by Atlanta in the first round. The Salt Lake City Summer League takes place from July 2-5, while the Las Vegas Summer League is from July 6-17. If Johnson proves he belongs in the NBA with a strong Summer League performance, he could earn a training camp invite. As for the rest of the pro careers of the rest of the outgoing Hoosier seniors, we’ll have weekly updates as they roll in. Even before the 2018 NBA draft had officially concluded, the 2019 mock drafts were already rolling in. And unlike this year’s draft, at least one Hoosier is expected to be drafted. Yes, it’s Romeo Langford. The kid who just arrived on campus this month is already expected to be a top-5 pick in the next NBA Draft. Inside The Hall collected mock drafts from around the interwebs to find out where Romeo Langford may find his name called come next June. The consensus is that Langford will be a top-11 pick, with ESPN’s Jeff Goodman having Langford as high as No. 3 overall. There’s a reason this kid spent an hour signing autographs for fans after his high school games. The USA U17 National Team made its final cuts this week in preparation for the U17 FIBA World Cup, and one potential future Hoosier made it onto the final 12 man roster. Five-star big man Isaiah Stewart of La Lumiere High School survived the roster trimmings and will be suiting up for the red, white and blue one week from now. Indiana is one of 10 schools on Stewart’s radar, and he made a trip to Bloomington in early June. Other schools on Stewart’s list include Duke, Michigan State, Villanova, and Louisville. After a ruptured Achilles prematurely ended De’Ron Davis’ sophomore campaign, the Hoosiers are making sure he’s back to 100 percent before returning to game action. Miller is content to help Davis heal on his own time. 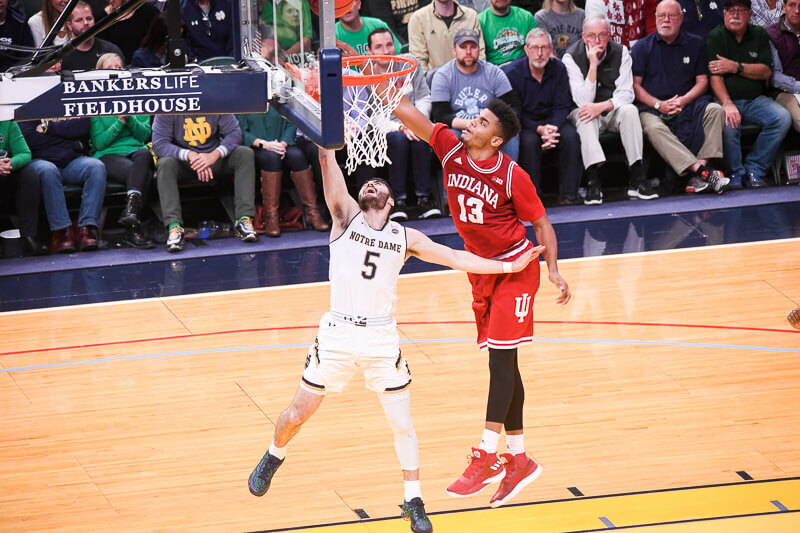 With no shortage of big men on the 2018-19 roster, Indiana has the luxury of being patient with Davis. All-time Indiana great A.J. Guyton has found a new gig. The former Big Ten Player of the Year spent the 2017-18 season as the Director of Player Development for Northwestern. Come 2018-19, Guyton will be on the bench as an assistant for Loyola Maryland. Guyton will try and help turn around the Greyhounds program, which won just nine games a season ago. · The successful international pro career of Jordan Hulls will continue at least another year as he plans on spending another season in the domestic German ranks. · Our friends over at Talking Hoosier Baseball had the chance to interview former Hoosier Joey DeNato in the first of their Summer Alumni Series. Listen here.